Beautiful lemon-yellow apple with a perfect finish. 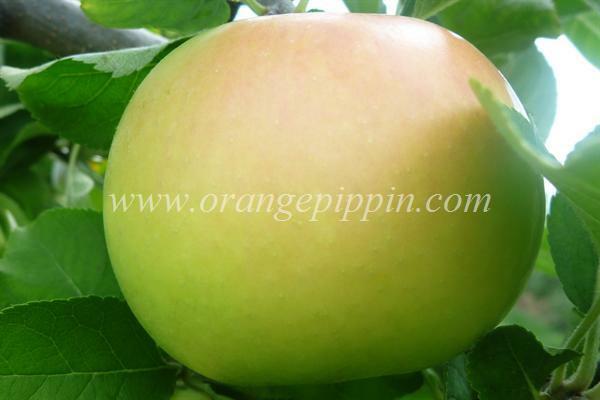 This high quality apple is very productive and is a good keeper for an early apple. Not sure if this is the variety I'm looking for....i answered most of the questions on the Apple website but this picture isn't like the apple I tried. My apple wasn't as round, it was similar in shape to the Delicious variety (without the bumps). Also I found it just sweet, no tartness but admittedly my palate isn't the greatest. Wish I knew for sure because I don't even like apples and I absolutely loved this one and want to eat it daily! Great early apple. Full sized with good fruit set in a below average year for later apples. Granny Smith flavor two to three weeks prior to full ripening. Mellow with a hint of tartness at full ripening. Stores at room tempatures for two to three weeks. Makes excellent daily eater and applesause. “No spray” variety too. Wonderful tart, crisp, early apple. Very juicy and firm, with flavor and sweetness under the tartness. Tastes like it would make good applesauce and pie, but so far the ones I've bought haven't stayed around long enough; they all get eaten out of hand. Tried my first Pristine today July 18th, 2015 - off my own tree. Still green, seeds still white, but the flavor is there, quite "granny smith" like. Another couple of weeks, we'll see if it mellows a bit. Early season apple with a level of tartness to it. It has a pear type of flavor. Medium density flesh and a crispy citrus bite. Its different for an early season variety but just average in terms of flavor. We have two Pristine trees and they are marvelous. They are the first tree to ripen, which is late July here in Alexander Valley.